Yes, we can function as a full fledged CMS with a couple of tweaks and plugins of WordPress. More and more new start-ups these days select WordPress as their CMS setup. The following are some free wordpress CMS and Magazine themes for you. New to WordPress? Or just busy? Or need unique design theme? Maybe Photocrati wordpress theme(Premium) will be suitable for you. Photocrati can offer the first web template solution that incorporates a flash-style homepage, richly-featured gallery management (batch uploading, resizing, thumbnails, watermarking, etc), and WordPress. No more custom fields. Most importantly, custom fields are no longer necessary to call thumbnails. Mimbo 3.0 includes a script that pulls images automatically from the post body, then resizes them with TimThumb. Support for WordPress 2.7. This includes code for sticky posts, comment pagination, threaded comments, wp_logout_url, and the rest of the new features. Sticky Posts. In the past, you had to create a “Lead Story” category. With the new version, that beige box contains whichever post you’ve marked as sticky, or whichever is most recent. Standard Bloggy Behavior. What I learned about Mimbo 2.2 is that a lot of people missed having a regular old blog component on the homepage, ie, simple chronological display. So I tried to retain the popular magazine-style layout, while organizing the middle column more like a standard blog. 125×125 Ad Support. Mimbo 3.0 comes pre-styled to work with the excellent WP125 plugin and its companion widget. With Linoluna is a simple and neat theme for a magazine-styled blog. The theme use the WordPress’ template tags quite extensively but still, it is very easy to use. 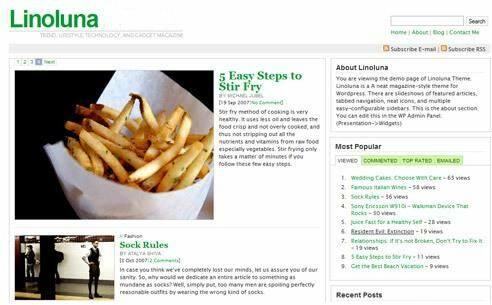 Linoluna best suits a multi-author WordPress blog. Linoluna is built to support WP version 2.0 and up. The theme is sidebar widget-ready. By default, the sidebar is divided into four sections. Sidebar-Top, Sidebar-Left, Sidebar-Right, and Sidebar-Bottom. Each sidebar can be configured in the WP Admin Panel (Presentation -> Widgets). So it will be only clicks-and-drags. This is the new version of Arthemia Free, the new Arthemia can list pages in your blog automatically. Unlike the old one, you do not have to hard-code the PHP file if you update your page title and structures. Drop-down lists will show sub-pages so do not forget to assign the page parent in the page editing panel. I added a fixed-sized search button (the magnifier) to overcome CSS incompatibilities across browser. The Unstandard is a split two / three column WordPress 2.6+ compatible theme. The home and archive index pages utilize photos rather than text. The latest update is completely optimized and stripped of any unnecessary code allowing for complete customization. Grid Focus is a three column widget enabled WordPress 2.6 or 2.7+ compatible WordPress theme. Prominent navigation bar with room to share important pages. The latest update is completely optimized and stripped of any unnecessary code allowing for complete customizability. Purple Fever is a fresh 2-column styled premium WordPress theme by WTM, created for sites that wish to establish a lasting impact with visitors. Love this post! Cool WP template list here. I will used them in my personal blog. Thank you for sharing these.